JERUSALEM (Reuters) - Israel said it had attacked Syrian military targets on Sunday after stray shells from fighting in Syria's civil war landed inside the Israeli-controlled Golan Heights. The Syrian shells hit an open area in the northern Golan Heights, causing no injuries, and in retaliation the Israeli military said it "targeted two artillery positions and an ammunitions truck belonging to the Syrian regime". Syria's military later said in a statement that Israel had attacked one of its military posts in support of terrorist groups, as it describes the jihadist rebels it is fighting in that area. It was the second day in a row that errant fire from Syria drew Israeli retaliation. 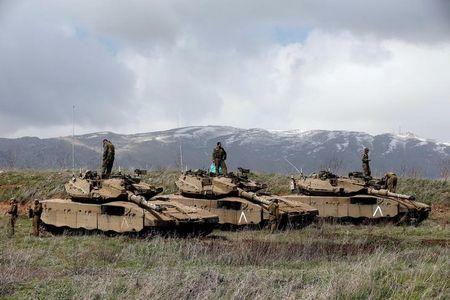 Israel has largely stayed on the sidelines of Syria's civil war, keeping watch over the Golan Heights frontier and occasionally carrying out air strikes or returning fire if there is a specific threat. It captured the Golan in a 1967 Middle East war. Intense fighting has rocked the Quneitra province of Syria, adjacent to the Golan Heights, since rebels there launched an attack on Saturday.